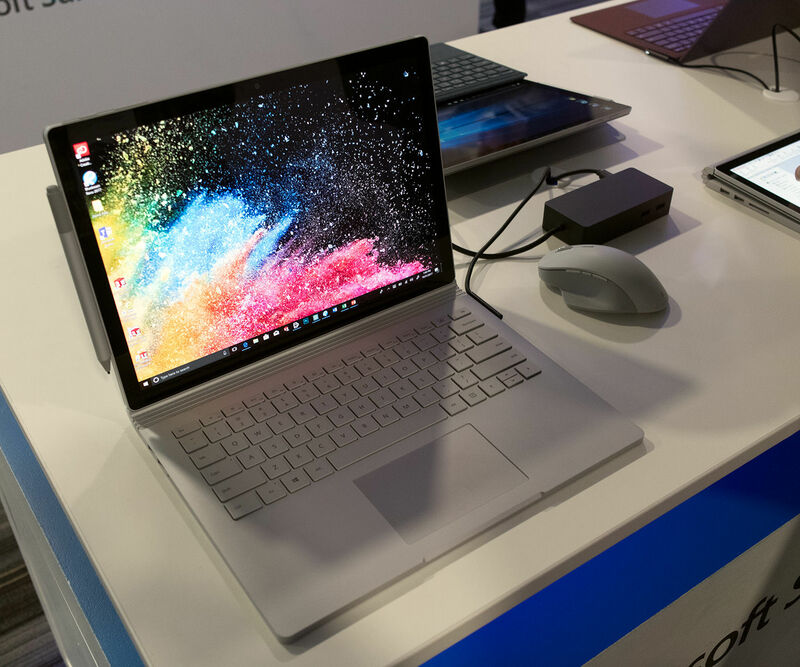 The Microsoft Surface Book 2 aspires to repeat the original Surface Book's history, blowing users away – only more so, with performance it claims to be five times greater than what the original 2015 model achieved. We got a close look at the new hardware at a recent press briefings in the UK and USand have all the information for you below. The fact that there is a Surface Book 2 is surprising enough, let alone two: a successor to the original 13-inch form factor, and a new 15-inch model. We spent some time with both, even unearthing what could be the first performance numbers on Microsoft’s new beast. How fast is it? 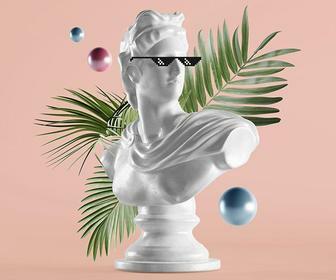 Try 8th-generation Core fast. Microsoft sprang for an Intel Core i7-8650U to power both most of the 13-inch and both of the 15-inch machines, and bundled them with what made the Surface Book line famous: discrete, powerful Nvidia GeForce GTX 1050 and 1060 GPUs, mounted in the base. There’s even a first for Microsoft – USB-C! – plus a next-generation Surface Pen and a lovely Surface Precision Mouse to round it out. No Surface is cheap, though, and in the US you’ll pay between $1,499 and $2,999 for the 13-inch Surface Book 2, and between $2,499 to a whopping $3,299 for the 15-inch model. UK pricing starts at £1,499, though that's all we know so far. You can pre-order both on November 9 for shipments on November 16, with one catch: Microsoft’s 15-inch Cadillac of convertibles will ship only to US customers, at least initially. 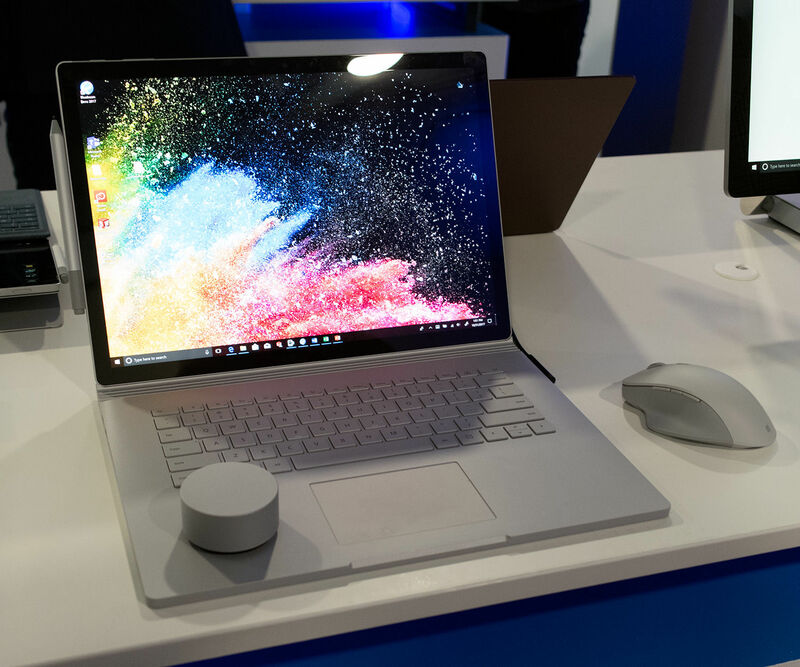 The new 13-inch Surface Book 2 looks nearly identical to the original Surface Book, with a glassy touchpad that seems about the same as its predecessor. The 15-inch SurfaceBook 2 gives you lots more screen space to draw and create on. Detach the Surfae Book 2 from its base, flip it over and reattach and you have full performance in a tablet-format you can draw on. As you can see, only one of the Surface Book 2 models has a 7th-generation Core chip inside it: the cheapest $1,499 13-inch Surface Book 2 model. In fact, that’s the only Surface Book 2 with an integrated GPU, too – all of the other 13-inch models include the Nvidia GeForce GTX 1050 (2GB), while the 15-inch model Surface Book 2s include the GeForce GTX 1060 (6GB). (PCWorld reviewed the GTX 1060 card in 2016.) That GTX 1060 is what provides five times more graphics performance than the original Surface Book, Microsoft says. The kicker? The tablets are fanless. The bases, however, aren’t, and the Surface Book 2 will turn on the fan during heavy-duty creative work (or gameplay). The similarities between the Surface Book and the Surface Book 2 extend to the display, which still hasn't reached the 4K threshold. The standard 3,000 x 2,000 (267 ppi) 13.5-inch PixelSense display graces the 13-inch model, while a 3,240 x 2,160 (260 ppi) 15-inch display is built into the larger model. According to Pete Kyriacou, who heads the Surface team at Microsoft, the reason to forgo 4K was simple: battery life. Both the 13-inch and 15-inch Surface Book 2 are rated at a whopping 17 hours of battery life – up from 12 hours in the original Surface Book. Pushing pixels consumes extra battery life, and Microsoft wanted to maintain a 17-hour battery life on both models, Kyriacou explained. 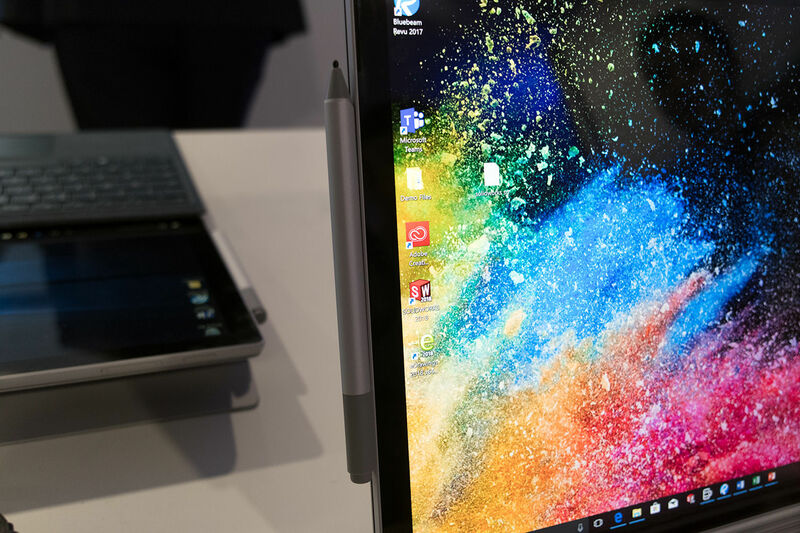 The 15-inch tablet alone weighs just 1.80 pounds, surprisingly light to hold in the hand. Remember, though, that it lacks the kickstand of its Surface Pro cousins. Though the Surface Book 2 weighs more on paper, it didn’t feel substantially heavier in the hand. We would have sworn that the edges were slightly rounded, and that the backlit keyboard keys were slightly scalloped. Upon closer inspection, though, that appeared to be a trick of the light. The Surface Book 2’s key travel is 1.55 mm, Microsoft says. 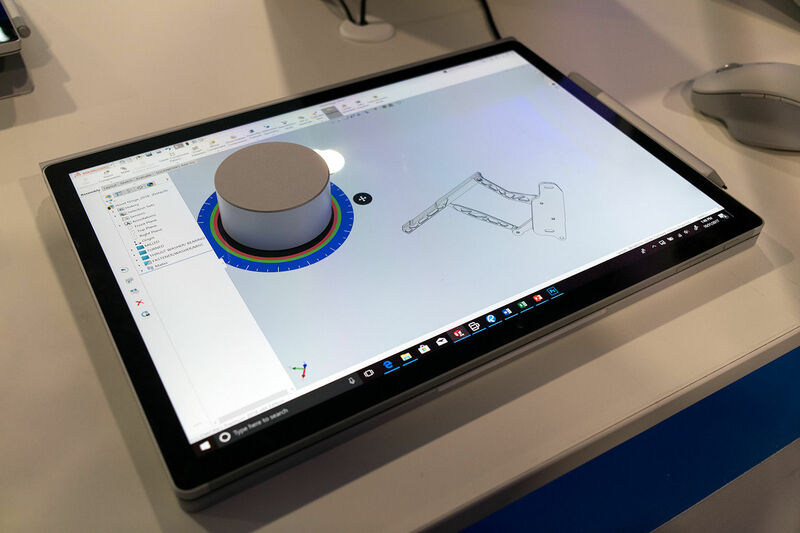 Like previous members of the Surface family, the Book 2 has a pair of Surface connections, which it uses for power and I/O: one that connects the base to the tablet; and a second on the right of the tablet, for power or connecting to the Surface Dock. There’s also a bit of a surprise: a USB-C port, a first for Microsoft’s computers. That USB-C port supports power in and out, video, and USB 3.1, according to Microsoft’s documentation. 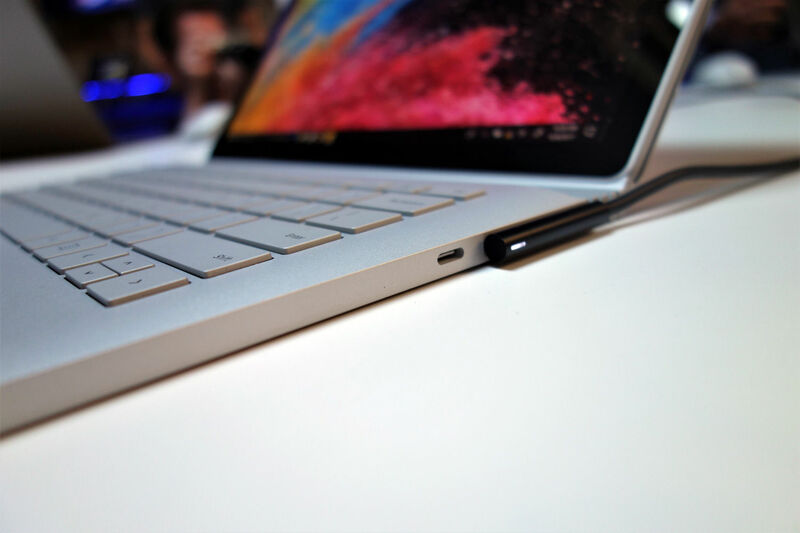 Right next to the Surface Book 2’s Surface port is a new USB-C port. Small improvements crop up everywhere you look. The hinge (which still leaves a bit of a gap) appears a bit more articulated, and the tablet disconnects a bit faster. (The "muscle wire" that holds it in place now works more consistently across different temperature ranges, too.) The Surface Book 2 reclines to the same angle as the original, officials said. While we wish we'd got a chance to try something like Photoshop or Premiere or Cinema 4D on the Surface Book 2, we only got to test out video games. Microsoft showed off two: Cuphead, and Gears of War 4. The latter is the most interesting, as it contains an integrated benchmark mode. So we ran it. On the 15-inch Surface Book 2, the benchmark confirmed that yes, the Surface Book 2 can run GoW4 at 60 frames per second. 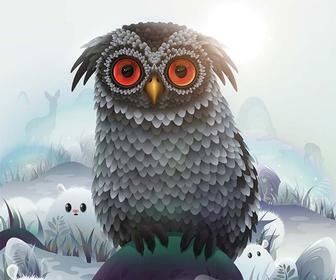 As you can see, the graphics performance is excellent – enough to run the game at Ultra and High settings. The bottom line: The 13-inch Surface Book 2 looks and feels like the original Surface Book. The 15-inch Surface Book 2 feels appropriately massive, though, giving the whole thing a sense of weight to match its under-the-hood performance. I can’t help but feel a little trepidation about the hardware issues Microsoft’s Surfaces sometimes suffer early on, but fingers crossed regardless. Over in the UK, we got a chance to try out what Microsoft calls the Next Generation Surface Pen, with 4,096 levels of pressure sensitivity. It ships in metallic silver with blue accents, as well as three other colours. The Surface Pen is generally considered to be the worst of the three main pen systems – with artist Sam Gilbey saying that "I just didn’t find it to be accurate or predictable enough in terms of where and how it’s going to draw" compared to either the Apple iPad and Pencil, or a Wacom Intuos tablet connected to a Mac, when reviewing the latest Surface Pro. 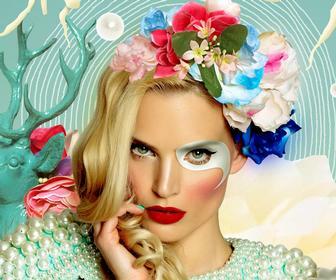 We spoke to Microsoft's head of industrial design, Ralf Groen, about this at the event – and he claims that any lack of accuracy when drawing is due to Photoshop, saying that the performance of the pen in applications like Inkspace is the best on the market. Since Sam's review, we've seen the release of both the Windows 10 Fall Creators Update and Photoshop 2018 - so we'll see if either of these have improved what the Surface Pen is like to draw with when we get our hands on a review unit in a few weeks. 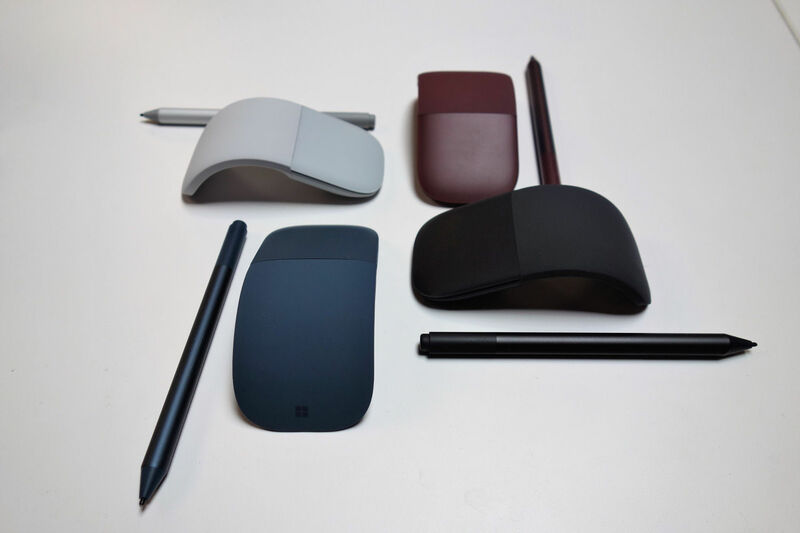 Microsoft’s Surface Pens and Sculpt Mice ship in a range of colors. 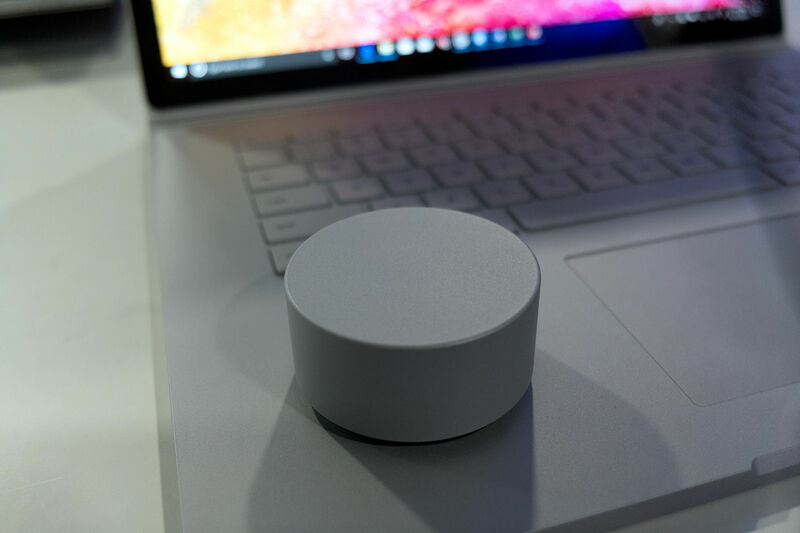 Microsoft’s existing Surface Dial also works right on the Surface Book 2 screen or separately. This provides a fast way to make adjustments to brush size, opacity or even change colours – and is especially useful when using the Surface Book 2 as a tablet, where you don't have access to keyboard shortcuts. 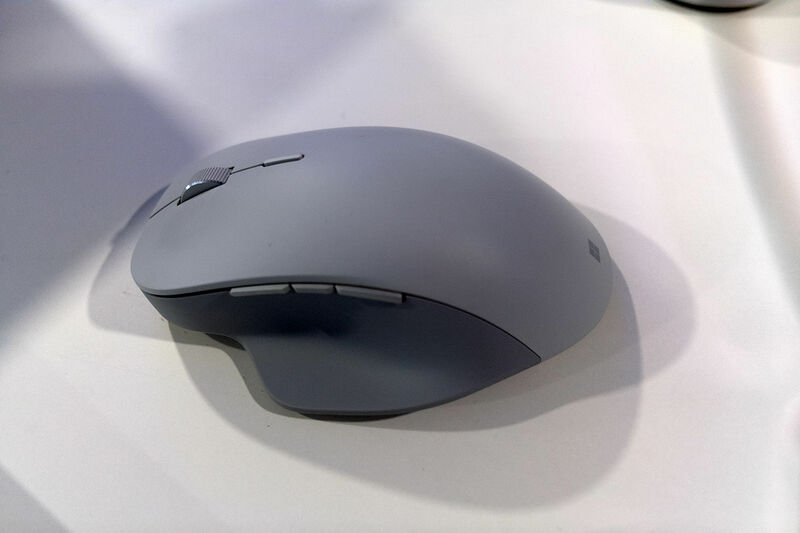 More interesting is the new Surface Precision Mouse, a $99 mouse that reminds me of older mice like the Logitech M510. A “handed” mouse – and exclusively designed for righties, sadly – the Precision Mouse uses Bluetooth to connect. Three buttons are on the side, with one on top. What’s nifty about the mouse is that it can be dynamically set for either smooth scrolling, or the notched scrolling that provides haptic feedback. Microsoft didn’t provide battery-life details, though the mouse appears to use microUSB to recharge. It felt great in the hand, though favouring righties was a little disappointing.